Earth's climate over the next few centuries - Solar System Planets And Moons Section. Earth's climate over the next few centuries. 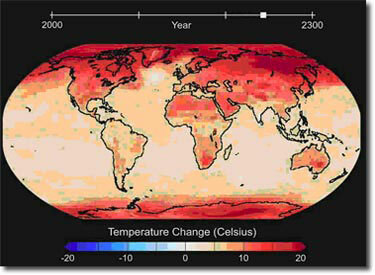 Model of the Earth's climate over the next few centuries. Massive Star Has a Hot Partner. Nov 1, 2005 Eta Carinae is one of the most massive and unusual stars in the Milky Way, and now NASA's Far Ultraviolet Spectroscopic Explorer satellite has detected a hot companion. This mysterious star, which scientists think is in the final stages of life, is located 7,500 light-years from Earth in the constellation Carina. Its companion star completes an orbit every 5.5 years, and FUSE was able to detect when it passed behind Eta Carinae, briefly dimming the amount of high-end ultraviolet radiation coming from the pair. Nov 1, 2005 scientists at the Lawrence Livermore National Laboratory have developed a detailed model of the Earth's climate over the next few centuries to answer the question... what if we burned all the fossil fuels by the year 2300. The answer, of course, isn't a pretty picture. In their model, global temperatures will rise 8-degrees Celsius (14.5 F), and melting polar caps will raise the oceans 7 metres (23 feet). The damage would be even worse in the polar regions, which could grow by 20-degrees C (68 F). Nov 1, 2005 This photograph of Saturn's Moon Dione was taken by Cassini on Sept. 20, 2005 from a distance of 2.1 million kilometers (1.3 million miles). The image shows the many canyons that crisscross the surface of the 1,126-kilometer (700-mile) moon, as well as its bright southern pole.